From the International Steel Guitar Convention in St. Louis, Missouri, I’m with one of the legends, Loretta Lynn’s own, Hal Rugg. A legend; does that mean I’m over 85, or what? We’re gonna try to keep the age jokes out of this, Hal. I will if you will. Boy, that was a heck of a show tonight! Nice going. Thank you; I appreciate it very much. We had a great band. Those guys can play anything, so it’s easy. Great Nashville band. You had three of the guys from Boots Randolph’s. From Boot’s band Tim Smith the bass player, Ravon Rotes the drummer, and Roddy Smith, Tim’s brother, and the sax player is a local guy. His name is Phil Smith, and he was incredible. I’d never worked with him before. He was great. You’d never know it from listening to you. The audience was estatic. They loved him; he was a great player. He really is an incredible player. Hanging on the Steel Guitar Hall of Fame wall is a bronze plaque with Hal Rugg on there. 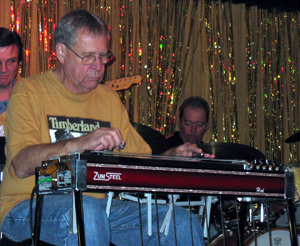 You are generally given the credit for getting steel guitar commercialized enough that it hit the big time in country music. Well, that’s a whole lot to live up to. I know I played on a lot of country records, most of which were Loretta Lynn’s. If you are talking about in that area, that was my most favorite thing to do, play with Loretta Lynn, record with her. I’ve got to mention that great intro you did with Loretta on "Don’t Come Home A Drinking With Loving On Your Mind", is a classic. Thank you very much; that was a lot of fun. Owen Bradley, who was Loretta’s record producer, always seemed to have the ability to pull the best out of you. He’d asked you for an intro, and if it wasn’t right, he’d say, "You did that last week. Do something else." So I’d just fool around until I found something that seemed to work. He’d say, "That’ll work." So then I’d know I had the right thing. That’s all he said after that great intro? He was glad about it. It took me a long time to get it on tape. It wound up being harder than I thought it was. In those days, you guys would only get 3 or 4 shots at it, wouldn’t you? Actually, he gave me as many chances as I wanted because it was the intro. When I finally got it right, then it was cool for the record. What a loss to the music business when Owen Bradley passed! Oh, absolutely. He was a great man, great producer, and a musical icon in Nashville. Well, tomorrow you are in here with Buddy Emmons, and the two of you are going to put on pretty much a show I got to hear you do out at the Bell Cove with the North Tennessee Steel Guitar Association Superjam. That was a heck of a night! It was great. He was great. I’m so glad that he is back playing. I was so afraid that he was going to quit. Hal, tell us how you got started playing steel. I started playing the guitar in Tucson, AZ. Actually, I was born in New York, but my mother moved out to AZ when I was a kid, and that’s where I started playing steel in clubs and school functions. I left Tucson in 1957 and have lived in Nashville for the last 42 years. You do a lot of western swing and jazz. You’re down there on that C6 neck often. I like the C6 neck. It’s a lot of fun. I think I’ve played so much E9 in the studio that when I get out here, I like to play C6. Johnny Cox calls the E9 the Kroger neck because it pays the food bill. Right, the back neck is for fun, and the top neck for money. A guy has got to have enough to eat. You got to pay the light bill first. If a kid was starting out today, how would you start him out. E9? Yea! I think that’s the most happening thing right now in county music. I would encourage him to explore everything. Learn how to play other stuff besides country music. He should know how to play everything. There is nothing wrong with knowing a little jazz, contemporary rock and roll. A guy like Joe Wright is a good example of that. Joe plays some of the most incredible stuff. He can play anything. He plays good country, good rock & roll, and if I was going to send a kid a direction, I would say start on E9, but learn everything. The most important thing I think that a kid learning to play now can have is to buy rhythm tracks, which are tracks of songs that don’t have any steel on them. He will have a good solid rhythm track to practice with. This is something I remember when I was a kid; there just wasn’t anything like this. The best you could have, was a metronome. Kinda forces you into the right chord structure. Actually. That is what you need to know to have a good musical background. I know that most guys that do CD’s, myself included, when I come out with a new CD, I also come out with a rhythm track for the same song. For a little less money, they can buy a rhythm track, too. Hal, Thanks for your time. Thank you so much, Gib. It’s been great.